Many people enjoy a great looking lawn and garden but it is not always easy to find the time and maintain equipment. Well-trimmed grass, manicured shrubs, and healthy thriving plants are just a few qualities that people look for in a perfectly maintained garden. At Acre Lawns, we’re a small team of lawn mowing professionals. We’ll take care of your garden maintenance in and around Park Orchards in the most efficient way. Let our highly skilled, friendly staff take care of your lawns and gardens, either as a one-time service or a regular scheduled job. We’ll be more than happy to make your grounds look great, time and time again. Mowing lawns of all sizes. Residential blocks, schools, commercial grounds – we do it all – and we do it well. Satisfaction is guaranteed. Give us a call – or get an obligation-free quote via the button below. Park Orchards (population of 3,718 in the 2011 census) is a small suburb located 23 km north-east of the Melbourne Central Business District. 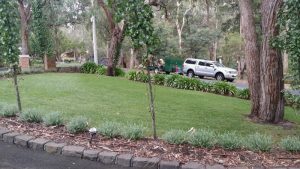 The team of Acre Lawns maintains lawns and gardens in Park Orchards and surrounding suburbs in Melbourne’s East. The suburb of Park Orchards is part of the City of Manningham local government area. Manningham City Council’s website has a range of useful checklists and guidelines for gardens and structures such as fences, pools, tennis courts and rainwater tanks. It also provides information about local plants, landscape plans, vegetation removal and bushfire management. There are Permanent Water Use Rules for residential and commercial gardens and lawns in the Yarra Valley Water District, which Park Orchards belongs to. You’ll find important regulations here for watering, hosing, washing, filling pools, spas, fountains and water features. For more information, check out our general pages on lawn mowing services, ride-on mowing and garden maintenance services.